BRYAN EATON/Staff photo. 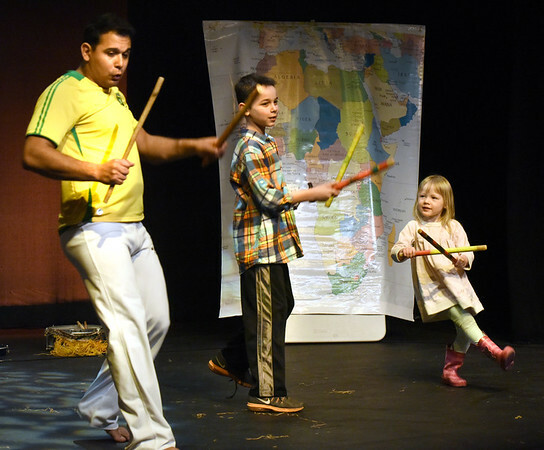 Ryan Rothberg, 11, of the River Valley Charter School, center, and Josie Wizda, 5, of the Newburyport Montessori School got on stage at the Firehouse Center for the Performing Arts to participate with the Afro-Brazilian Ensemble on Wednesday morning. The troupe performed Capoeira: a unique hybrid of martial arts and dance in which partners pair off and spar in graceful, fluid motions and was part of the Firehouse Center's School Show Series.